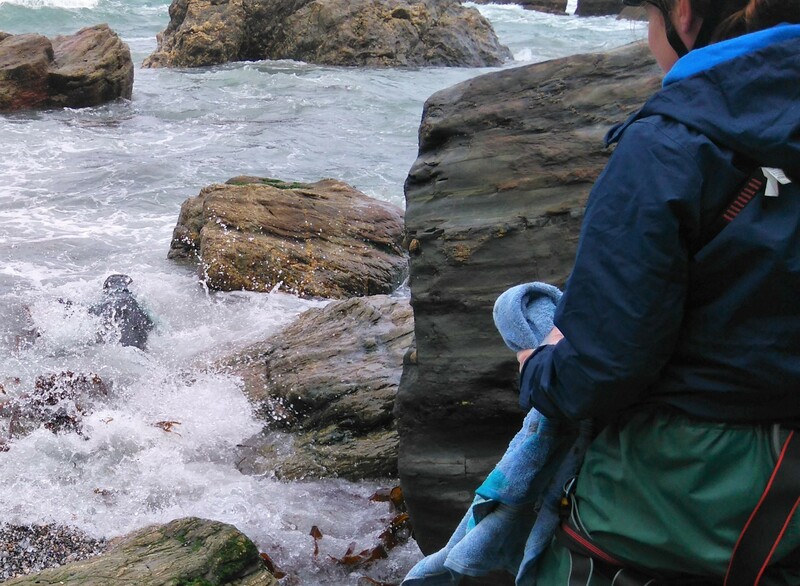 Last week Cornwall Seal Group Research Trust’s (CSGRT’s) Sue and Kate went out on one of their twice weekly surveys of the West Cornwall seal complex. 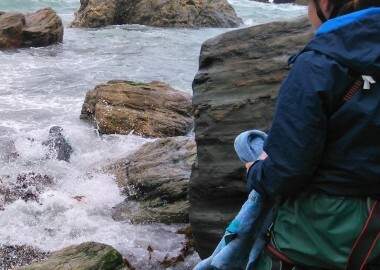 Usually at this time of year, seals are hauled on the offshore island, but the rough seas and cooler temperatures have obviously confused the seals, leaving Sue and Kate surprised to find a good number hauled on the mainland site instead. 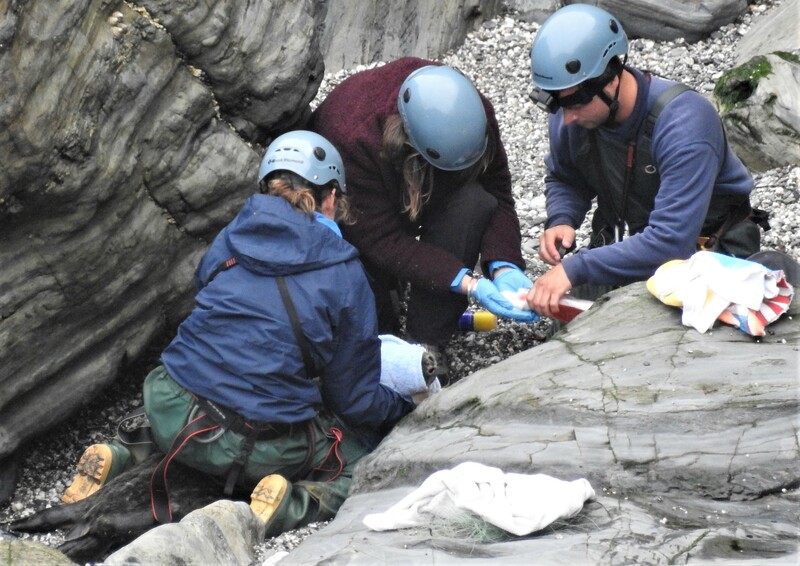 As Kate began counting, aging and sexing the seals, Sue was taking photos to enable the individual identification of each seal. Suddenly they spotted an extra seal lying on its own at the back of the beach. 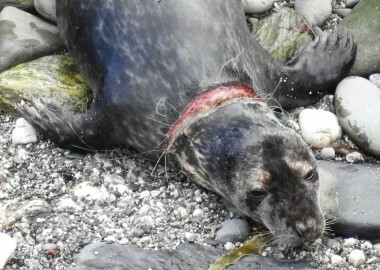 Although nearly invisible, as Sue zoomed the camera in, she was saddened to discover that the young male seal (one of last year’s pups) was actually entangled in a long piece of monofilament net. This was cutting in deeply around its neck and there was no doubt that the seal would not survive without being rescued. 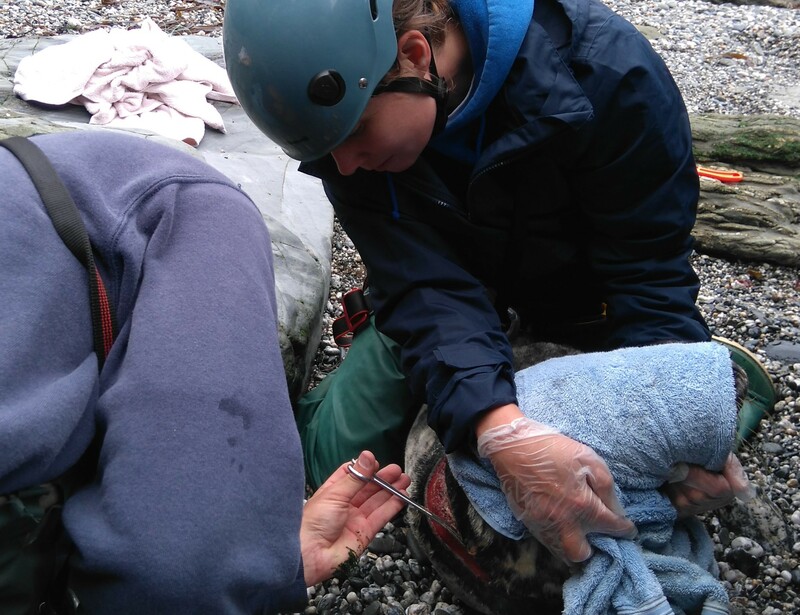 Whilst rescues are not always possible given weather, sea and tide conditions, combined with how close the seal is to the sea and the number of other animals present, Kate and Sue were hopeful that a rescue might just be possible. 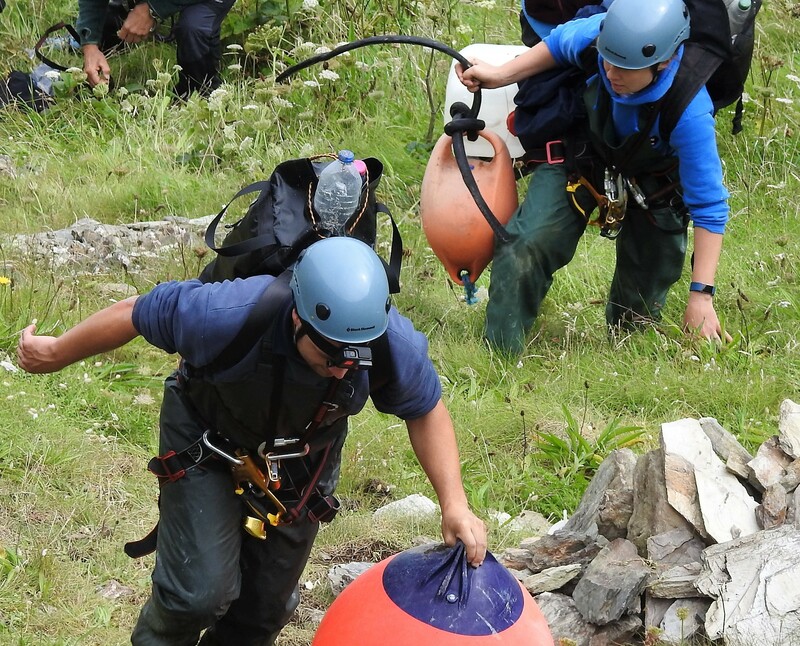 They rang British Divers Marine Life Rescue’s hotline number (01825 765546) and their Welfare Development and Field Support Officer Dan Jarvis was soon on the scene and agreed that a rescue might be possible. 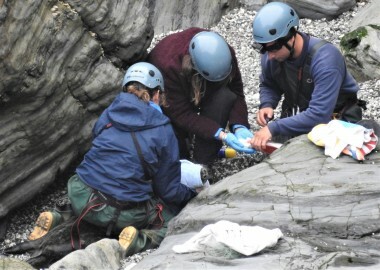 A rope safety team of Chris Howell and Phil Knight were mobilised, while Tamara Cooper, Animal Care Curator at the Cornish Seal Sanctuary, arrived to assist as well. 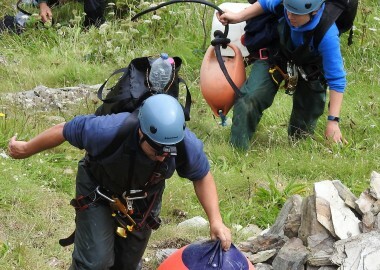 As a crowd gathered to watch, the rescue team made their way down the steep cliff. 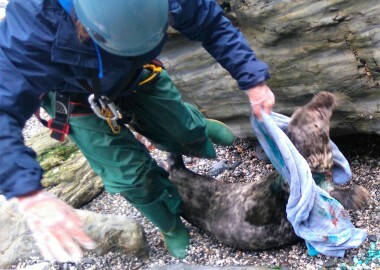 The team confirmed that the young seal was actually a boy before the towel was removed and, sensing freedom, the seal spotted the sea and accelerated off at top speed for the surf. 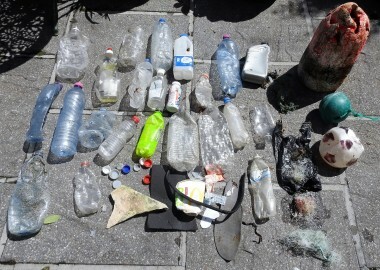 Without a second glance, ‘Lucky flipper’ was off to join the numerous heads bobbing about just offshore. Letting go… …and Lucky flipper was off! 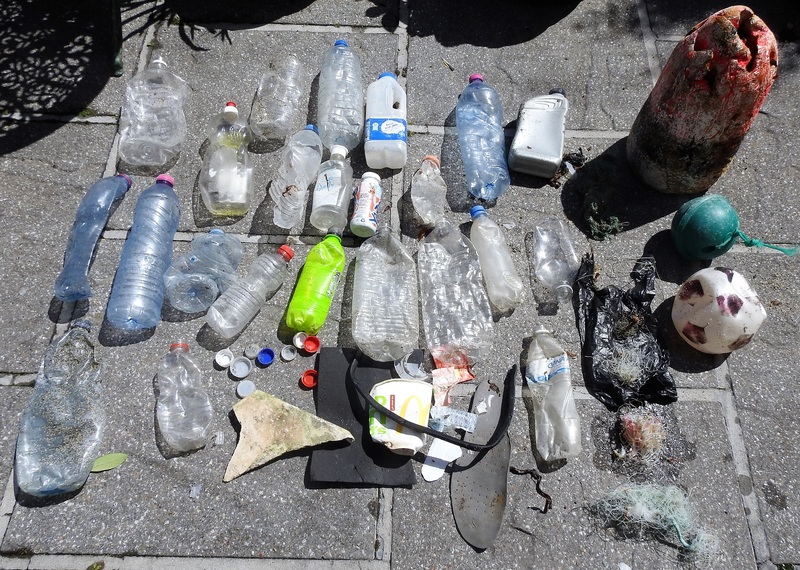 Keen to do all they could to help seals, the rescue team did a quick ‘two minute’ beach clean and were able to remove 23 single use plastic bottles, five other small pieces of dangerous monofilament net, four fishing buoys and numerous bits of plastic. 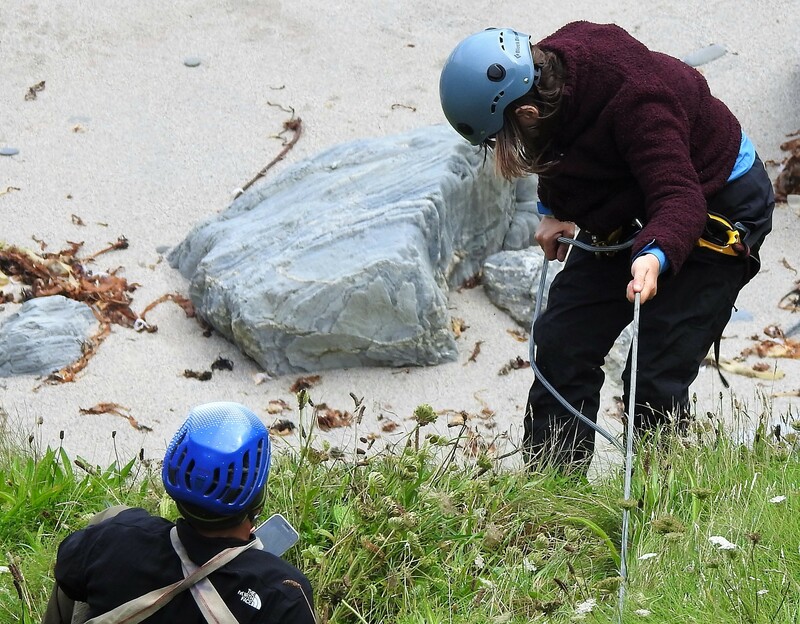 All the litter was packed into rucksacks for the ascent back up the rope to the clifftop, where onlookers gave the rescue team a huge round of applause. 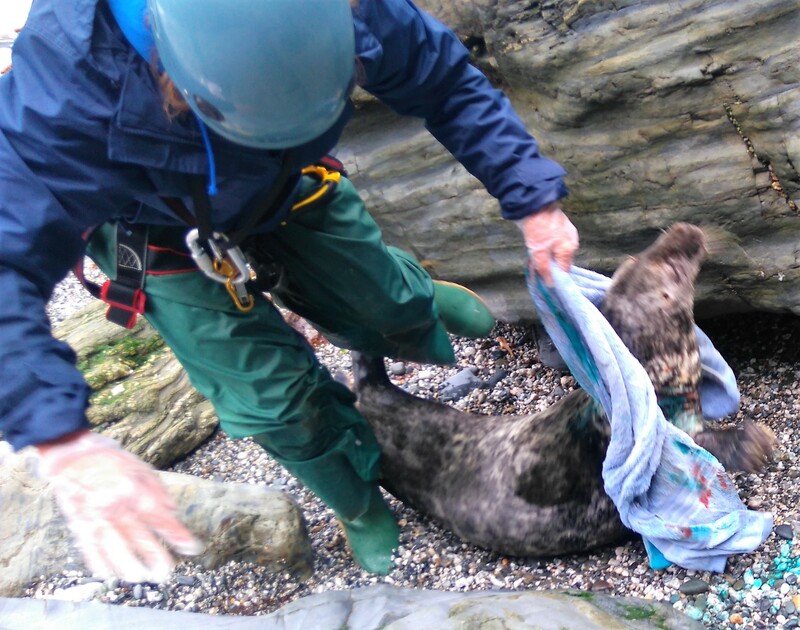 Back in the office, Sue and Kate were able to confirm that ‘Lucky flipper’ was the same seal that BDMLR had tried to rescue two days earlier but had not been able to do so as a helicopter had flown low directly over the cove just prior to the rescuers leaving the clifftop, which had spooked some of the seals, including Lucky flipper, into the sea. To support or donate towards our important work helping seals around the SW, please email [email protected] for more details. 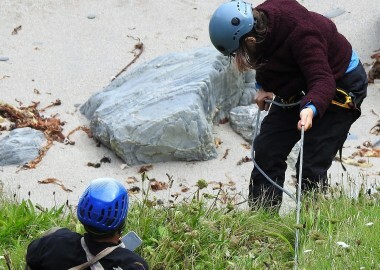 Huge thanks to British Divers Marine Life Rescue, the Cornish Seal Sanctuary and Chris Howell and Phil Knight for their rope safety expertise. 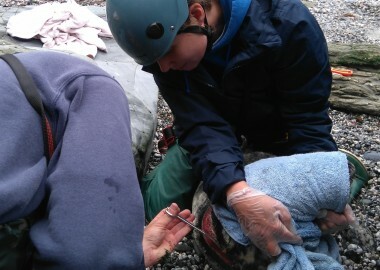 Today, Sue and Dan from CSGRT and BDMLR did an interview with BBC Spotlight about this rescue for screening tomorrow.